The team of editors at LearningExpress is dedicated to creating the best and most up-to-date skill-building, academic test-preparation, and career/vocational test-preparation titles available. We’re constantly watching market trends, which allows us to be extraordinarily creative and authoritative as we stay ahead of the curve in our editorial approach. LearningExpress makes a point of being cutting edge in bringing you the best and most sought-after titles for all your skill-building needs. LearningExpress Editors create books for every stage of school and life — from college entrance exams such as the SAT, ACT, and GRE, to professional exams like the Firefighter Exam, Police Officer Exam, and ASVAB, to our new Allied Health exam prep titles like Medical Assistant Exam, Nursing Assistant Exam and Physical Therapist Assistant exam. We also author skill-builder books in key areas like algebra, basic grammar, vocabulary, and spelling, chemistry and more. We are proud of our best-selling series, which include 20 Minutes a Day, 15 Minutes a Day, and 501 Questions—as well as exciting new ones, such as the Write Your Way college guides and ‘Becoming’ career guides. The words we use to communicate every day are important in every aspect of our lives. From relaxing, to working, to studying, to taking tests, we use words to share with others how we feel, what we think, and why we think that way. Without words, it is diffi cult to express our ideas to the rest of the world. The more words we know—the larger our vocabulary—the more clearly we can communicate with others. Our vocabularies reveal our knowledge to the world; therefore, a person with a large vocabulary has the advantage of self-expression. This book will help you learn the words you need to know to successfully express yourself in school, work, and your personal life. 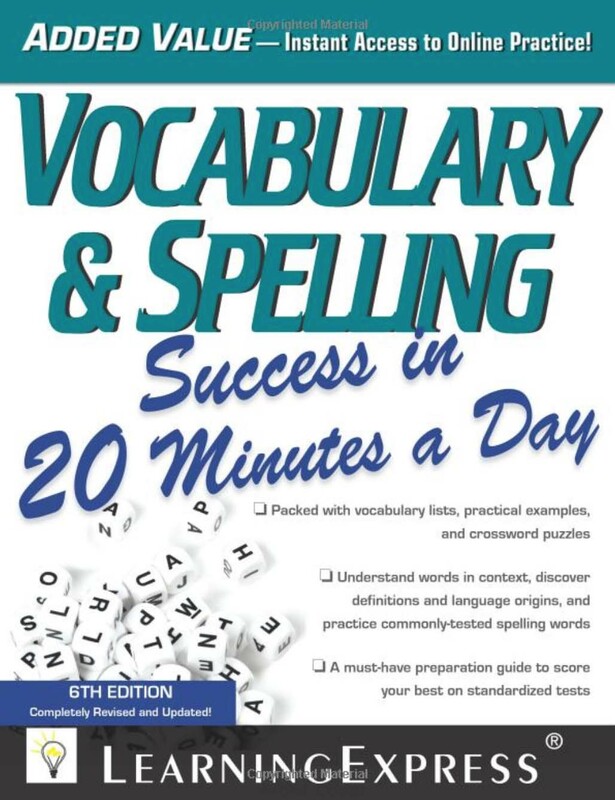 The words in this book have been carefully chosen to help you learn what you need to know to pass any test—from standardized tests, to civil service tests, to college entrance exams, and to professional job interviews—and continue to build your vocabulary, even after you have fi nished using this book. In each of the following chapters, you will complete practice exercises that have been created specifi cally to help you understand words inside out. You will learn pronunciation, spelling, context, defi nitions, word parts, denotation and connotation, synonyms, and antonyms. The word lists are grouped into categories, so you will be able to associate them with like words and remember them more easily. There is also a crossword puzzle at the beginning of chapters 4–18 to introduce you to the new words before you begin to work on the practice exercises. Then, you can take the Posttest at the end of the book and gauge how much you’ve really learned about words and how you have improved your vocabulary.